The Disney Princess Snow White kid's wig adds the perfect finishing touch to the Disney Princess Snow White kid's costume. This wig is perfect for Halloween or year round costume play time dress-up. The Disney version of Snow White first made her appearance in 1937. 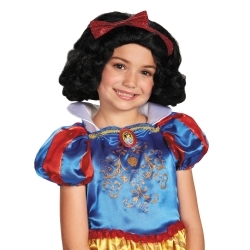 The Disney Princess Snow White kid's wig is colored as pictured. Wig is one size fits most children using adjustable elastic strap.